In nature, flowering occurs in the fall, after the long hot days of summer. The long nights and short days of autumn signal the start of flowering. 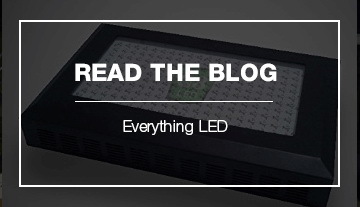 With LED grow lights we mimic the seasons by changing the light cycle from 18 hours a day to 12 hours. Give your plants 12 hours of uninterrupted darkness and 12 hours of light to induce visible signs of flowering in two weeks or less. 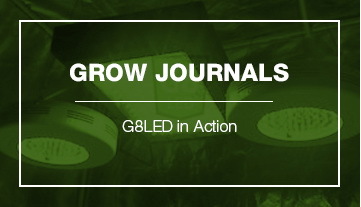 Adding more light to the plants also help give bigger flowers and yield. Add a 90 Watt Red LED Flower Booster at this stage for more robust flowering. Once flowering starts, it can last can last eight weeks or longer. The most potent time to harvest is when trichome formations turn from clear or milky to amber to reddish brown in color. During flowering, growth patterns and chemical changes in the plants. Stems elongate and leaves grow progressively fewer blades. Flower formation is rapid at first then slows. Phosphorus and potassium uptake increase to promote floral formation. Your nutrients should have less nitrogen and more potassium and phosphorus during flowering. Reduce frequency of nutrient feeding as this can cause your plant to get nutrient burned. 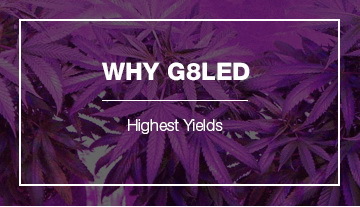 Use 30% fewer nutrients with LED flowering grow lights as compared to MH/HPS systems. Avoid overwatering and harvesting too early. Flowers initially appear near the top of the terminal growth and gradually develop on lower branches starting at the tips and moving downward. Flowers have white pistils which look like hairs. The pistils are attached at the base to an ovule which is contained in a light green pod called a calyx. Pistil packed calyxes form dense clusters along the stems. These clusters are called a top or cola. The calyxes form develop rapidly for the first four weeks after which they grow at a slower rate. Most of the harvest weight is then put on the last two or three weeks of growth when the calyx formation has slowed. The majority of the plant yield comes in the last couple weeks. The trichome pistils will continue to swell and change in color from white to amber to reddish brown. Once this occurs you are ready to harvest your plants.